It was barely 7am as we searched for our hostel on the narrow, dusty streets of old town Yazd. I was in a decidedly picture-no-sound mood – I’d discovered that sleeping in hijab on an overnight bus was my new high-water-mark of backpacking travel annoyances. The boys were hot, sticky and fractious, their Celtic disposition really not made for 40C in the morning. And then we came around the corner and walked slap into this London cab. CAM and BigB were enthralled. Why was it here? Where was it going? Who drives a London cab in Iran? The friendly folk from itsonthemeter.com were staying in the same hostel, or at least some of them were. It turns out that driving a cab from London to Sydney comes with a fair share of visa and vehicle import/export rules (funny that! ), so at least one of the crew was still waiting to get into Iran. But Hard-Hearted Hannah (the cab) was there and they gave us a tour, showing off the customized meter which my kids just loved. All just goes to show that wherever you are, you just never know who you’re going to run into – and that’s part of the fun of it all! 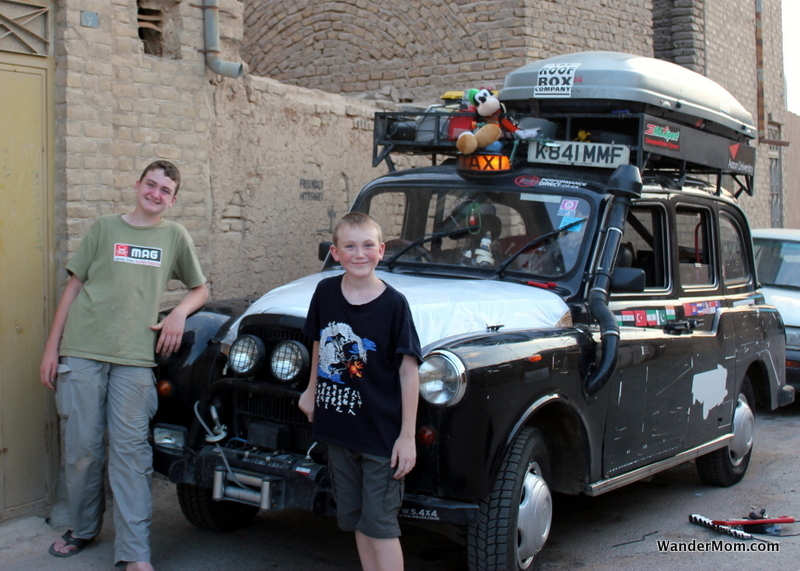 This entry was posted in Iran and tagged Black Taxi, Iran, itsonthemeter.com, Photo Friday, Yazd on December 21, 2011 by wandermom.